(CNN) -- Portsmouth manager Paul Hart has confirmed the Premier League club have accepted a bid from Tottenham Hotspur for England striker Peter Crouch. 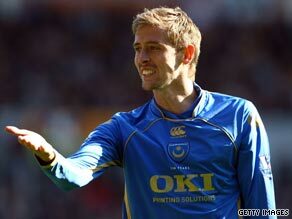 Peter Crouch looks poised to return to Tottenham after Portsmouth accepted a fee for the striker. Tottenham manager Harry Redknapp, who signed Crouch from Liverpool when he was manager of Portmouth, appears to have succeeded in reuniting the giant striker with his former Pompey strike-partner Jermain Defoe for a fee in the region of £10 million ($16.43m). Should the deal go through, it will further increase Tottenham's strike power as Crouch will join Defoe, Robbie Keane, Darren Bent, Ramon Pavlyuchenko and Giovani dos Santos in a powerful-looking front-line. "Obviously I'm disappointed to see Peter leave, but given the severe financial restraints in place here we had no choice but to accept an offer from Tottenham," Hart told the Daily Mirror newspaper. "I think people need to realise that Pompey have been punching above their weight and could no longer sustain the level of spending that has gone on here over the last three years." Hart, who last week signed a two-and-a-half year deal to remain with Portsmouth, claimed it was a result of a bid to balance the books following a period of unrealistic spending under former manager Redknapp. Hart also insisted that the takeover spearheaded by Dr Sulaiman Al Fahim would not lead to a Manchester City-style spending spree. "Even though a new owner is poised to come in our dealings in the market will be modest in comparison to the past," added Hart. Crouch, 28, actually began his career with Tottenham but left the club without making a first-team appearance. He has since seen service with Queens Park Rangers, Portsmouth (twice), Aston Villa, Southampton and Liverpool.